Something curiouser than the perennial fuel shortage emerged last week. President Muhammadu Buhari’s New Year message was the clearest indication yet that the three most senior managers of the oil industry do not agree on the cause of the problem or how to fix it. It may be a genuine epidemic of confusion and inertia – or perhaps something worse: incompetence. But whatever it is, we’ve just about had enough of it. 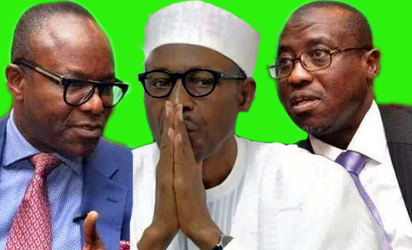 While Buhari toed the line of the Group Managing Director of NNPC, Maikanti Baru, that hoarding by oil marketers was responsible for the shortages, the Minister of State for Petroleum Resources, Ibe Kachikwu, took a different position. The truth lies somewhere between Buhari’s denial and the elegant half-truth of Kachikwu, his junior minister. Whichever way they spin it, the problem is far from over. The lines surfaced in the first week of December. After the Federal Executive Council meeting that week, Kachikwu assured the public that he would sort out the problem and clear the lines that weekend. The lines have shortened somewhat, but the problem of frequent fuel shortages that has haunted the country for decades now, is not about to end. Nor are the old, worn-out excuses about to change. Buhari’s New Year message on petrol scarcity was a warmed over version of what he said 40 years ago as Federal Commissioner for Petroleum Resources: that the government would not spare saboteurs who had exposed the public to a miserable Christmas by disrupting the supply of petrol. Forty years on, Buhari is not only Minister of Petroleum Resources – with his Chief of Staff serving on the NNPC Board. He is also President, after three attempts. Yet he speaks like the captive-in-chief of the same saboteurs he complained about in 1977.
Who are these saboteurs? Filling stations in this country have an estimated underground storage tank for 200 million litres of petroleum products. The economics of setting up filling stations may be dubious, but it’s common sense to assume that the owners know they can only remain in business in the long term by selling products. The same logic applies to owners of surface tank farms (with receptors in the Badagry-Bakassi axis having a holding capacity of 500 million litres) and over one dozen jetties, which are also mostly in private hands. To blame them for hoarding the 43 million litres of petrol required by motorists daily when thousands of underground and surface tanks across the country are empty or when the stock is sitting in NNPC vessels at sea, is pathetic. Unlike NNPC, the regulator-competitor that does not have to worry about feedstock or the exchange rate, private operators have to hedge and deal with prohibitive interest rates, among other unpredictable costs of doing business. Of course there are bad eggs among oil marketers. But even these bad eggs have been nurtured by years of indulgence and criminal complicity with fat cats in NNPC, with government after government, including Buhari’s government, turning a blind eye. President Goodluck Jonathan’s government ran up subsidy of $6.8 billion, with the entire apparatus of government holding the purse for Diezani Allison-Madueke, whose singular pleasure it was to spend like no woman’s business. Yet, even under Buhari, NNPC is still, well, NNPC. According to NEITI, the corporation, which has failed to account for $629 million, has executive exemption from remitting a certain unknown and unknowable percentage of its earnings into the Treasury Single Account. In order words, the corporation keeps an account that is known only to Buhari and whoever else it pleases him to share the information with. And Buhari is looking for saboteurs? How can the NNPC behemoth continue to function in this way and be expected to be efficient or accountable? How can NNPC continue to remain a regulator, an arbiter and a competitor at the same time and Buhari is still looking for saboteurs to punish for the fuel shortages? To find the saboteurs, all the government needs to do is to look at the man in the mirror. Even though the process was fraught with controversy, government took the right decision by privatising the downstream sector – selling off its investments in Unipetrol, National Oil and African Petroleum. Also, the decision to completely deregulate diesel was painful at first but over time supply disruptions have petered out and price stabilised. Raising petrol price from 87 Kobo to 145 Naira per litre was a courageous step. But in the government’s haste and trepidation, it packaged the increase as the long-sought-for answer to deregulation. But it wasn’t. It just happened that oil prices were falling at the time and the government was cash-strapped after raiding its reserves to defend the Naira. Now, the chicken is home to roost. No serious deregulation can take place with the government leaving the NNPC the way it is. The government can move petrol price up or down; it can scramble every laden ship to Nigeria’s seashore, until it restructures NNPC and creates the right legal framework for the business, it’ll be wasting its time. It’s a scandal that beggars belief that the four refineries managed by the NNPC get daily crude allocation of 450,000 barrels and yet are unable to process enough petrol to fill the tank of a Beetle car. It’s a scandal beyond description that NNPC the sole importer of petrol, which also knows the local daily demand, is unable or unwilling to make any provision for occasionally fluctuations in the market. And Buhari, the petroleum minister, is looking for saboteurs? Buhari took the right step 10 days after taking office in 2015 by issuing 65 licences to private individuals to establish refineries. Before that, President Olusegun Obasanjo had given licences to 18 companies to establish refineries. But it’s one thing to organise a licence bazaar (the beneficiaries, apart from Dangote, have virtually all disappeared); it’s quite another to create the legal environment for businesses to operate. It’s not a coincidence that the government’s only profitable refining investment today is the NLNG, set up and operated under a law completely different from the moribund Petroleum Act of 1969, the nemesis of the industry. The government refineries have become the ATM of vested interests in the NNPC. Year in year out they ask for and receive millions of dollars for so-called turnaround maintenance and yet the only thing that gets turned around is the size of their pockets. If Buhari is serious about ending the embarrassing shortages, he should stop looking for scapegoats and end the fruitless rounds of meetings of the blind. In the short-term, he can ask the IOCs for help and offer incentives, while he restructures the NNPC to be the nimble and efficient regulator that it can be. The current price cap is not working and the only thing worse than its failure is a government that cannot see the obvious and deal with it with honestly and transparently. The biggest petrol saboteurs are inside Buhari’s government. The post Buhari and the two blind men appeared first on Vanguard News.